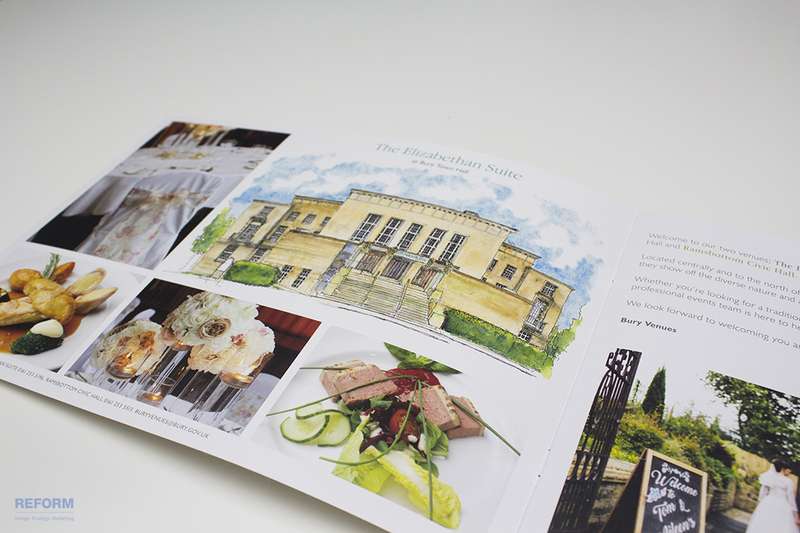 Reform were also tasked with the design a brochure to promote weddings at The Elizabethan Suite and Ramsbottom Civic Hall. Reform Creative designed a logo that included all three venues in a modern and fresh illustration style. Along with the logo we created a colour palette for each venue which was based around the period of the buildings. A typographic guideline document for internal and external use was also presented and actioned. For added value, we produced a brand for each venue which included one of the building illustrations and the name of the venue so that Bury Council could use individual branding along with the umbrella brand ‘Bury Venues’. The original strap line was ‘a venue for all occasions’. We felt the word ‘venue’ was repeated too often so amended the strap line to read ‘for all occasions’ which the client ran with. The brief for the wedding brochure was to position the two Bury venues, The Elizabethan Suite and Ramsbottom Civic Hall, as first choice for weddings in the Bury area. 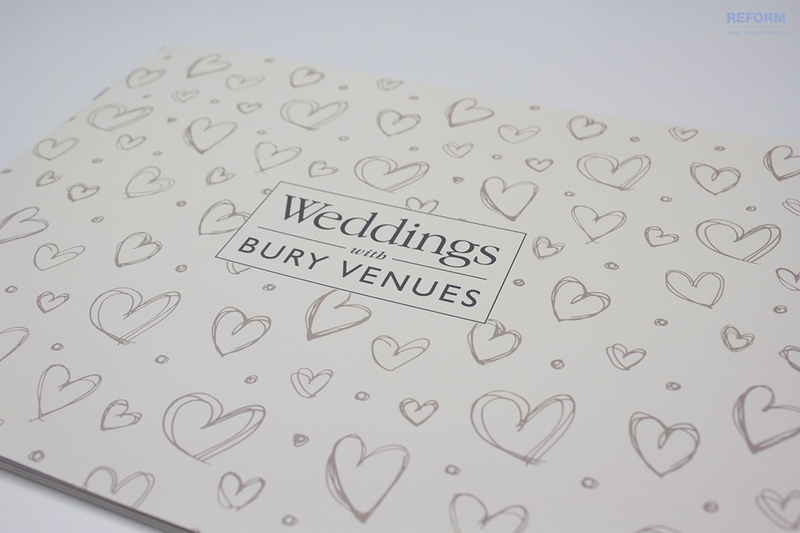 After a competitor analysis, we discovered that other venues had large budgets to market their offer so the Bury Weddings brochure needed to match the kind of quality output of their competitors but without the large availability of a large budget. 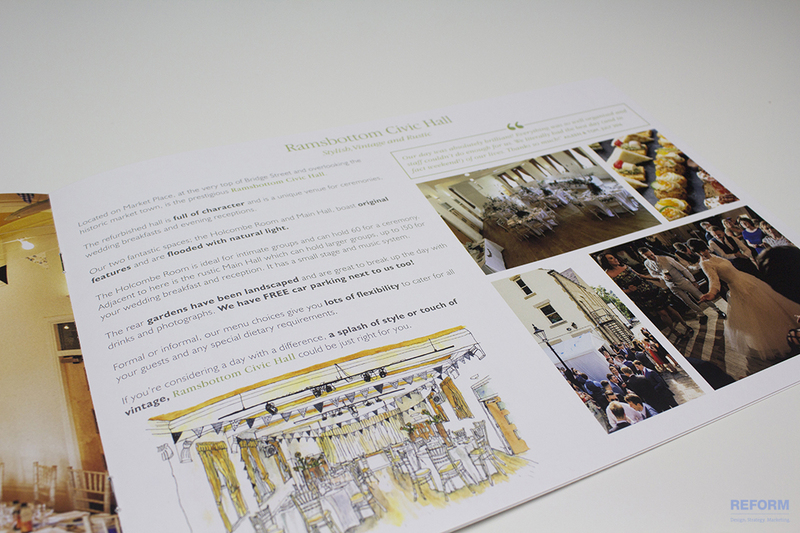 The brochure was designed using the branding guidelines we had put in place for Bury Venues. The design is clean and easy to read with images to encourage the target audience to select one of the venues for their wedding. Along with the Brochure Reform also produced outdoor advertising and posters. Reform have also been commissioned, by Bury Venues, to produce an Events Brochure, Christmas Promotional Material and print/on-line solutions to promote sports activities for young people at the Longfield Suite, Prestwich.